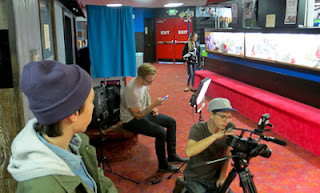 In January, Clearwater staff member Matt Garrity, also a musician and 17th Chapter front man, heard from friend and music producer, Christian Hansen, that he needed two young people to perform in a professional music video for the London-based duo, Still Corners. Matt offered to find a boy and girl from The Clearwater School to be in the video. He asked Lily and Arlo, both 13 years old, who enthusiastically agreed. Matt took some photos of Arlo and Lily and sent them to the director who approved them for the project. The shoot was two days later on a school day. 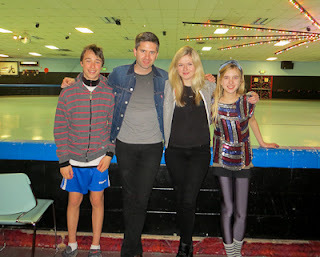 Matt drove Arlo and Lily to the set (Skate King in Bellevue), where Christian Hansen, producer, director and camera man, introduced himself and the two members of Still Corners, songwriter Greg Hughes and vocalist Tessa Murray. Lily said, "When we went there, we didn't know whether we'd get a big part or a little part. We thought we might just be background. It was a huge surprise when I found out I was the star of the video." Christian took Lily and Arlo over to the costumer who had them try on a variety of clothes. Arlo tried on a pair of pants and a few sweaters, before he was ready. Lily reported, "we brought a bag of clothes, but the costumer only had me use one thing of my own--my socks. I tried on a few things he brought that were so uncomfortable that I said I didn't want to wear them. It took about an hour to find something that worked. The clothes they put on Arlo looked better than the clothes he usually wears." 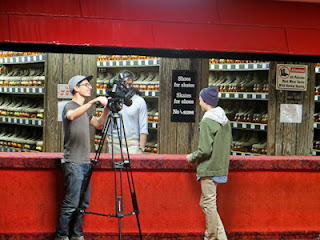 After wardrobe was complete, Christian filmed the first scene. Arlo entered the skate arena, walked to the counter and asked for skates. While the "arena employee" (Greg Hughes) got the skates, Arlo was instructed to look over his shoulder towards camera, act like he saw something he shouldn't have, then look back. To get the shot he wanted, Christian told Arlo basic things to do, more specific instructions, and then he told Arlo to find the camera. 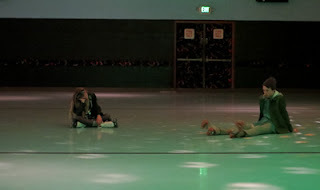 The next scene had Greg slamming the skates down on the counter and Arlo dragging them off. They had to shoot that scene three times to get the timing right. During the next hour and a half, Lily was the focus of filming, so Arlo talked with the band, hung out with Matt, ate some snacks and explored the skate rink. He liked the band. Arlo said about their music, "I feel like it's the kind of music you'd find in space." According to Lily, "The band members were really nice. They weren't there for a lot of the shoot, because they had to go for an interview. We took a picture with them. The producer/director was really nice too." The band also had to fit in a meeting with their record label, Sub Pop. Next, it was Lily's turn. I put on roller skates and had to learn how to roller skate because I usually roller blade. It was different, especially because I was supposed to look good at roller skating. The producer/cameraman made it look really good. He roller bladed backwards and zipped around us while he was filming us. We had to use roller skates because that looks better on camera. He had a list of the shots he wanted to get. He would tell us "you should do this." 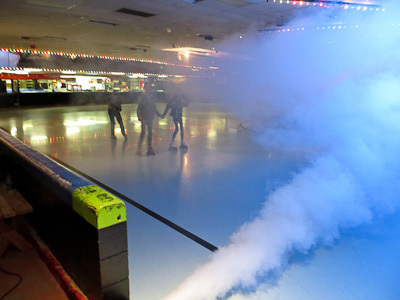 There was a fog machine, and I had to leave because I felt like I couldn't breathe in the fog. They got a few takes in the fog and then they had to take some shots of us holding hands without the fog. That was the scene with the most takes. 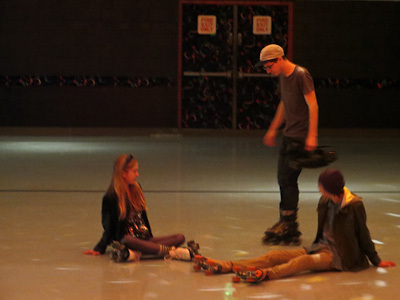 It's really hard to skate holding hands. In one of the shots we were supposed to hold hands, then let go of hands, but I accidentally hit Arlo in the stomach. They used it anyway, because they liked that we were laughing and looked like we were having a good time. The video had slightly under 20 total shots, and only one scene was shot in just one take. In one scene, Lily walked up to the bench, spun around and sat down. She said they probably did that scene 10 times to get it right. According to Arlo, "I never heard the word 'cut.' The only thing that was a bit boring was the amount of time it took to set up a shot before the filming of each scene actually happened. We got to set at 9:30am and left at 4:30." As for working on this project with Lily, Arlo said, "It may not have been so natural if it hadn't been with Lily, but because we're friends and have known each other since we were four, it was easier to play and try different things." For example, they each tried to cross in front of each other at the same time, and ended up colliding, collapsing on the floor and laughing. "And the credits scene would probably have not been us sitting in the middle of floor, because we didn't know he was filming us." Lily agreed it would have been awkward shooting the scenes "with a random stranger I didn't know, but I would have done it." "I liked being in a professional music video that will get a bunch of views," Lily commented. "I've made a bunch of movies in and out of school, but the most views my movies have had is 50." As of April 17, there were over 42,000 views of "Berlin Lovers." Arlo had fun and would consider doing it again, but has no desire to act professionally. On the other hand, "I'd rather have a job acting than taking minutes at School Meeting." Lily didn't find any part of the day difficult. When asked if she would do it again, she said, "Definitely!" Wow, Lily and Arlo look great - so natural on camera. What fun! There's only one word for this: Supercool!